The theme for VSN today is "On Cloud 9". Hostesses are presenting some good challenges. I'm so excited to be asked to host one of them. My challenge to you is to make a card of something you see in the air. It can be anything from butterflies, birds, trees, skyline, clouds, rain, planes, etc. 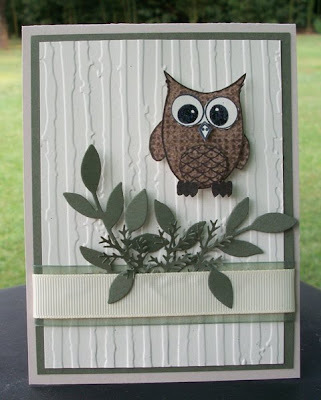 You can use punches, stamps, stickers, designer papers, rub-ons or chipboard. It's your call. Take it easy and let's see what you got to share. My first one I used Sahara Sand as a base. I used PTI's Wise Owl set. I stamped the large outline owl on pattern paper and cut it out; as well as the belly of the owl. The belly was raised on the main image. Eyes and nose were stamped on white scrap and black stickles were used on the eyes. When the owl was cut out and put together, foam adhesive was used to make it pop off the card. I used Always Artichoke for SU's Little Leaves and MS's leaf punch. Always Artichoke was also used on top of the base card. The ivory on top of that was embossed with Cuttlebug EF Distressed Stripes. I've always thought it looked kind of like a woodgrain pattern. I put Green Organdy Ribbon (SU ret.) across the bottom with Ivory Grosgrain on top of it and attached it to the Artichoke piece. The leaves were tucked between the top ribbon. My second one is similar as I used a different kind of bird. I just love this little bird and branch punch from SU. I used a different pattern paper for its body and touched the rim of the body and wing with Bravo Burgundy. The wing was raised with foam adhesive and placed on the body. A silver gem is the eye. I used my new Labels 10 Nestability on Rose Red, cut and embossed. Pearls were placed on either end in the scallops. 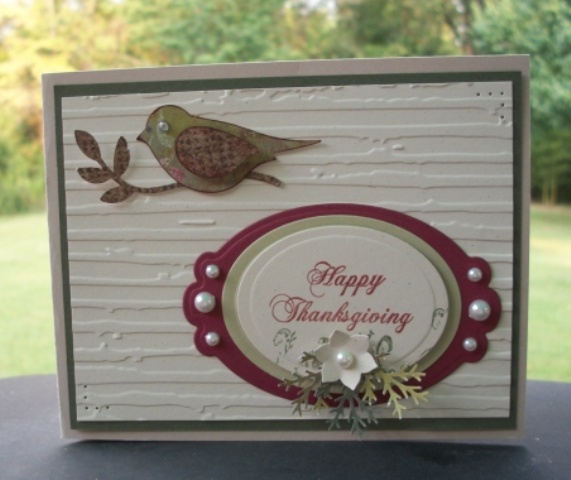 A little swirly stamp was stamped in Always Artichoke on the bottom edge of an embossed oval with Happy Thanksgiving stamped above it. This was placed on a slightly larger oval. A MS leaf punch and flower punch was then placed at the bottom with a tiny pearl inside the flower. Two corners were pierced. I hope you liked my examples. Thank you for joining in and coming by to visit. I am so glad that you came and hostessed a challenge!! We always have so much fun at VSN's! I think both of your cards are just FABULOUS!